Hi looking forward to making these- can these be made in a jumbo size muffin? How long would you bake for? I’m sure you can make them in a jumbo muffin pan. Start checking them at 25 minutes – I’d guess they’d bake 25 – 30 minutes – a toothpick should come out clean in the center. 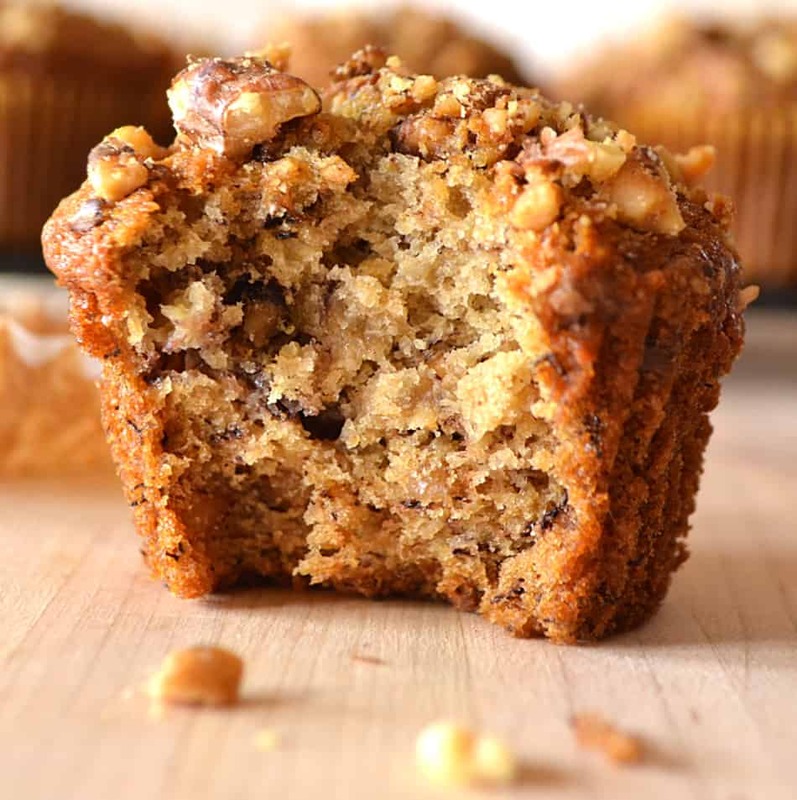 I have never made banana nut muffins and I searched, found this recipe and it just looked like it would be good. I am pleased to say I wasn’t disappointed. What a delicious discovery! Oh my goodness these look PERFECT! Thank you Erin 🙂 I love them – they’re perfectly simple & delicious! This look completely delicious, Amanda! I can taste them now! I wonder if the cartoon character you’re thinking about is Garfield with the lasagna? Not 100% sure, though. The walnuts on top of these is perfect. I could eat these everyday for breakfast I’m sure. Pinned! Pluto also used to do it with pie! And I think maybe Goofy did too! Muffins are one of my favorite quick breads to make. These muffins are beautiful and I love that you used whole wheat flour in the recipe. That’s right up my alley. I’ve been wanting to grind my own wheat flour for a while now, so I’ll be trying that soon. I stumbled upon a blog post saying how you can grind wheat berries in a coffee grinder. Since my mom gave me one recently I think I’ll try it out. That’s too funny about your coffee grinder. Last night I made a little oat flour with the coffee grinder. I used oat groats and was happy that it worked. You got me stumped on the cartoon character, but Garfield does sound vaguely familiar. Banana bread and muffins do smell heavenly when they are baking. These muffins look divine!! I’ve been throwing overripe bananas out because I’m too lazy to do anything with them, but I need to be making these muffins instead! I think the cartoon your thinking about is Mickey Mouse. yes Mickey Mouse did do that. I’ll send a few your way 🙂 Thanks so much Kushi! These look absolutely perfect! Gorgeous photos!! The muffins are soo good (and easy). We love them! Thank you for sharing your recipe. Hi Nicole! You’re welcome – so glad you enjoyed the muffins! I’m saving this recipe to use again and again…Perfect recipe with a few simple steps. The muffins were so moist and tasty! Thank you for sharing! Ive made these muffins twice, once for my bosses birthday brunch and once for my kids. Everyone loves them!!!! The second time for the kids I toasted pecans for the topping and they turned out great. 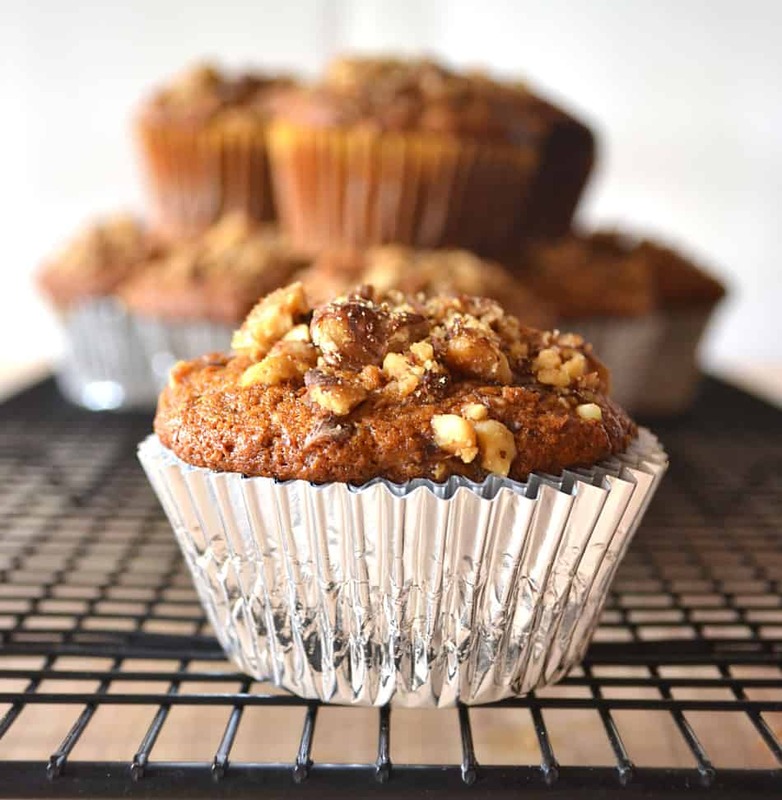 This recipe has replaced my other banana nut muffins because they are simply delicious!!! Yay! So glad you love the muffins! These are definitely our favorite as well – it’s the only recipe I use anymore! I love these banana nut muffins. It is my new favorite recipe. How are these frozen and thawed for later? If they taste as good as they look, I’d love to make and freeze some for my sudden cravings. Hi Candy. Honestly, I haven’t. Baked goods never last long enough in my house to make it to the freezer. If you try it, I’d love to hear how they freeze. I’m getting ready to try these for a bake sale! Just wanted to say, never throw your over ripe bananas away! Freeze them! You can toss the whole banana, in the peel, into a freezer bag, and when you need one or two, just defrost in your microwave. Works perfect. That’s what I’ll be using today. Awesome advice Cindy! Using over ripe bananas make a world of difference in baking! I love new variations of favorites that I make all the time. I have been using a recipe from a little lady from Hawaii for years to make my classical Banana Bread. I had a bunch of bananas and thought I would make muffins instead. I searched Google, and your recipe had a 5 * rating. I did my due diligence and read the comments. So I am one of those home cooks/bakers, that usually never messes up a recipe. I loved that yours had whole wheat flour, and I was sold. So back to my MAJOR mess up. I mix up the batter, top them with chopped pecans (walnuts in the batter) and bake them. At the same time I am putting together ingredients to make Quiche Lorraine. Doung too much, after I had taken the muffins out of the oven, I realized I had forgot to add one of the ingredients, the melted butter. In a panic, I cut in to one of my muffins, and frankly, they tasted just fine. Very moist, just not the texture of a normal muffin. So if you want to try it, just think that you are cutting out a huge calorie and fat content, and makes them a little healthier! So glad to hear the muffins turned out well, even with the little mishap. Funny how sometimes what you think is a mistake turns out great! Our daughter loves these muffins. She made them for the county fair in open class and received the junior division reserve grand champion! Glad you all enjoy the muffins and congratulations to your daughter! My daughter enters baked goods every year in the county fair and it’s always so much fun for all of us! I’ve never tried subbing sour cream for milk in this recipe, but usually when I do sub it in a muffin or scone I reduce the amount of butter. These sound great! I would love to try this recipe. Does it matter if you use light brown sugar in place of dark? I already have light.. So i was just wondering. You can use either or in any recipe that calls for brown sugar – but the light brown sugar doesn’t have as much molasses flavor as the dark sugar. 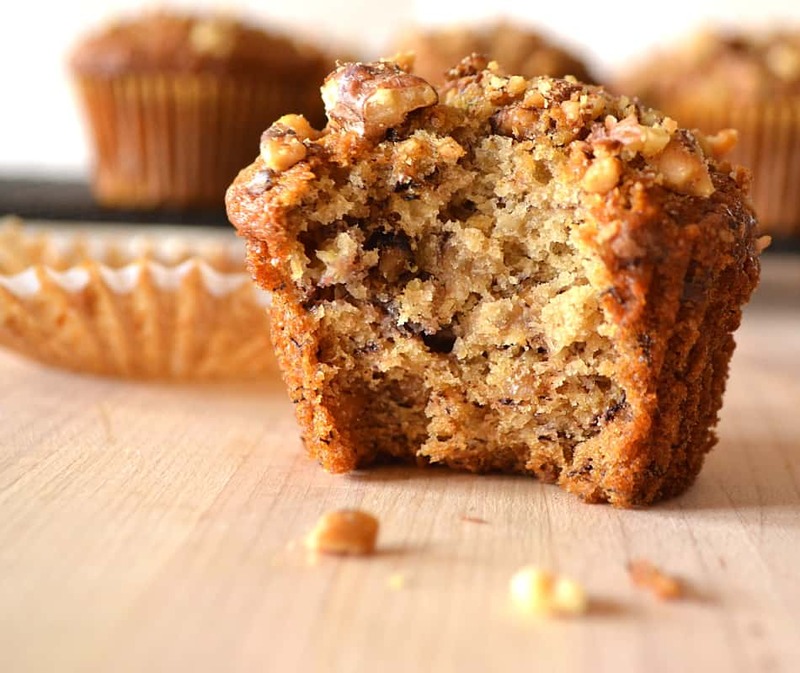 I am making these banana nut muffins tonight!! My sweet hubby just came back from the store with all the ingredients! I have never used whole wheat flour before, so I am excited about trying this recipe! My 12 year old son will be in the kitchen helping bake these! He is homeschooled, so I always try to have him learn real life lessons as much as possible, and cooking is always one of his favorites! Can’t wait for my house to smell banana nut declicious! Hope you and your guys enjoyed the muffins! Whole wheat flour is a great ingredient! You can definitely start adding it into more of your baked goods – it’s easy to sub half of it for all-purpose flour in muffins & quick breads when starting out! I made these today, very good! This recipe is definitely a keeper! I’ve made this recipe or a variation of it probably 3-4 times now and they are so good that there are rarely any left by the time they have cooled down completely. I wouldn’t change anything about this recipe and can’t thank you enough for sharing it! These muffins come out moist and delicious every time. Yay! So glad you love them as much as we do! Thank you – I love great feedback like this! Loved this recipe!! I somehow lost my muffin pan so I had to use my bundt pan. I baked it for 45 mins in 350 and it worked beautifully. I sprinkled some whole oats on top of the batter before baking to add a little flare. I will be making this recipe all fall and winter long!!! Awesome! Glad you enjoyed the recipe! These muffins in a bundt is a wonderful idea! Yummy! I made these exactly to your recipe and they were delicious. It’s rare that the final product looks just like the pictures, but my muffins turned out just like the picture!!! Thank you for sharing. Loved the recipe! I added Quaker oats to give it a little more nutritional oomph. Will definitely make again! I made a batch of these last night. I only had two bananas so I substituted the third for some applesauce and it cam out amazing! Even my picky preschoolers finished theirs and asked for more. My only complaint is that there are no leftovers for breakfast this morning!!! So glad everyone enjoyed the muffins! Now if only I could get my picky preschooler to eat anything – she won’t even look at these muffins! Thanks for stopping by Hanaan! I loved these muffins. I made mine with almond flour in place of the white flour and added 1/2 cup more for the conversion and the wheat flour as directed they turned out great. They didn’t last very long. I’ve never tried them with almond flour – I’m excited to try your version! Just made these…. And just got them out of the oven. They look and smell great… Haven’t tasted yet. Was the cartoon character “Snuffles” from Quick Draw McGraw? I’m going way back…. You can google him…. He would do anything for a dog biscuit. Hi Robbie! So glad you enjoyed them! I just googled Snuffles – I think you’re right!!!! Hi Colleen. So glad you and your family enjoyed the muffins! Hey… I made a batch of these now and I’m loving it….. I’d wanted to bake these ever since I ate these at a fancy bakery nearby… These turned out exactly like those! Thanks a ton dear! Thanks so much for your recipe Amanda! These are the best banana nut muffins I’ve ever had! Thanks so much Twanna! Glad you enjoyed the muffins! I have made these muffins twice now and they are delish. They are really moist, I make half of them with cranberries. Hi there! LOVE these muffins! I’ve made them countless times, and they are always a major hit! I was just wondering if there was any way to use this recipe and put the batter in 4 mini loaf pans rather than a muffin tin. Suggestions? You could easily use mini loaf pans – you’ll just have to keep an eye on them. Same temp – but add some additional baking time. Maybe 25 – 30 minutes and until golden brown & toothpick comes out clean. Thank you, thank you, THANK YOU for such an awesome recipe. 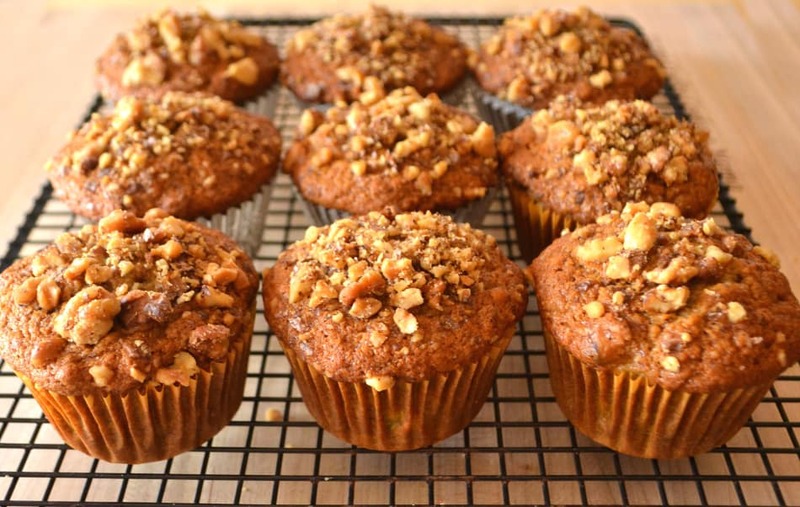 This is a staple in my home and I have been told these are the best banana nut muffins. So glad you enjoy the muffins! Just made these. Delicious! I was out of butter so subbed 1/3 c coconut oil and I turned out great. Saved! Hi Nicole! So glad you enjoyed the muffins – I’ll have to try them with coconut oil! Yay! Glad they were a success! Hi Dee! So glad you all enjoyed them! I made these tonight, and they’re wonderful! It’s definitely the best banana muffin recipe I’ve tried. I even have pie in the fridge, which is my husband’s favorite, and he ate two of these instead. Thanks for the recipe! Yay! So glad you & your husband enjoy the muffins! I made these banana nut muffins to go with our Sunday breakfast this morning. So light, moist, and flavorful. As they were baking the aroma filled my house. This recipe is a keeper! Can I make them gluten free and use gluten free flour mixture instead of whole wheat? Gluten-free flour should work great. Have ripe bananas and looked up your recipe. Making these this morning! Thank you. Everyone loved these! I made 6 of them in a large muffin pan. Can you give me a tip on how to adjust the baking time? I let them go 26 minutes and then used a cake tester every couple of minute until it came out clean. That’s a hassle. Made these today (45 minutes ago) and they are delicious! The bananas were not too ripe and maybe the reason why they didn’t turn out sweeter. However, delicious and will definitely make them again! 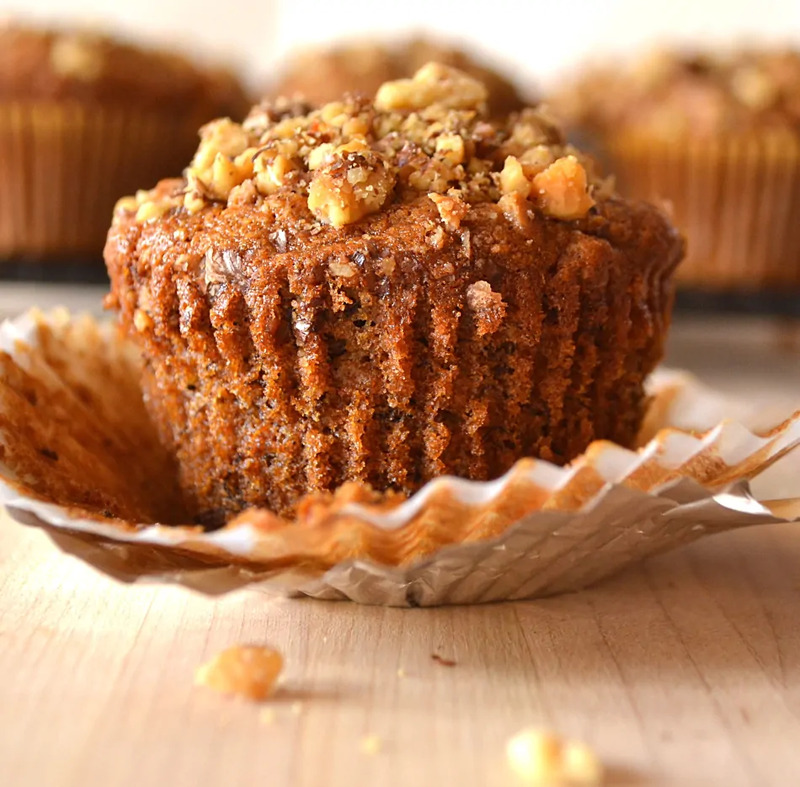 Pecans are just as delicious in these muffins! Tried these tonight on a whim. And let me just say theses are delish! I Rarely follow recipes exactly but this one I did pretty dang close with two small exceptions…. first extra cinnamon because yah know it’s awesome. Second I used spelt whole wheat flour because I love it also it was probably a little closer to 3/4 c spelt since the spelt cooks slightly different than regular flour. I love that these have significantly less sugar than the typical recipe. and I think I will even try subbing out some of the sugar for honey next time just to see how it goes. Thanks for the great recipe… oh and incase anyone cares or tracks I got 15 muffins and calculated these to be about 213 cal per muffin. I just made these muffins and as I am typing this review, I am eating them. These were by far the BEST, absolute BEST banana nut muffins I have ever tasted outside of buying them from the bakery. Maybe even better than the better. It had the right amount of sweetness, they were so moist and delicious. I absolutely loved them. I will be pinning this recipe to my Pinterest and saving this website to make these again. I just made these muffins and as I am typing this review, I am eating them. These were by far the BEST, absolute BEST banana nut muffins I have ever tasted outside of buying them from the bakery. Maybe even better than the bakery. It had the right amount of sweetness, they were so moist and delicious. I absolutely loved them. I will be pinning this recipe to my Pinterest and saving this website to make these again. This may be the cartoon character you are thinking of, but you are far, far younger than I am. It’s the one I thought of and then looked for on line. These muffins are heaven, btw! I think I’ll try mixing blueberries with the bananas next time, for fun. I just made these. Best banana nut recipe I’ve ever tried. SO GOOD!!! I think the cartoon character was Lizzie McGuire! Her conscience was a cartoon character that would say how she actually felt. Oh! Just read the other comments. Maybe it wasn’t 😉 Cant wait to try out the muffins! I made these muffins and they were delicious!! I love that there’s some whole grain flour in them. I actually added some milled flaxseeds to make them even more nutritious for my kids. My kids devoured them and now they want more :). I also used half butter and half canola oil because i didn’t have enough butter in the fridge, and nobody could tell the difference. thank you for a great recipe! Just ate one of my freshly baked muffins! I’m definitely not a good Baker but these were very easy to make and measurements and recipe where so precise and perfect! So thanks a lot thankfully made 24 instead of 12 cause they wouldn’t have been enough! Made these exactly as the recipe states and they were absolutely delicious. Thank you for posting this recipe. I baked these banana walnut muffins tonight with my daughter and they are the best! So moist and tasty. Thank you for the delicious recipe. Will definitely be making more! Just made these and they are great. Amanda thank you for this great recipe! Muffins were moist and delicious! Recipe is a keeper! I think you may be thinking of Precious Pup. When he got his treat, he would float up in the air, with um sounds & float back down. Trying the muffins tonight. Just finished them! My husband really liked them and my daughter, who doesn’t even eat banana nut, liked them too! I thought they could be slightly sweeter but I’m a junk food junkie. Amanda, I really love this recipe. Especially using the whole wheat flour. I changed it up a little to get more good fats and protein in for my grandkids. I added 1/2 cup flax seed and replaced walnuts with roasted sunflower seeds. Not quite the same, but I try every way I can to disguise good nutrition for my picky grands. I only had one large banana so I halved the recipe and it still turned out great! Also added some semi sweet chips and walnuts on top. Thanks!! This is such a great recipe! They fragranced the entire house and didn’t last very long. I’m doing them for a second time and trying to make the mini muffins to see if they last longer:) Thank you for this delicious recipe! We enjoyed every bite. Amanda, thank you for sharing this receipe. It is simply wonderful, very moist and truly delish. It is certainly worth saving to make again and again.